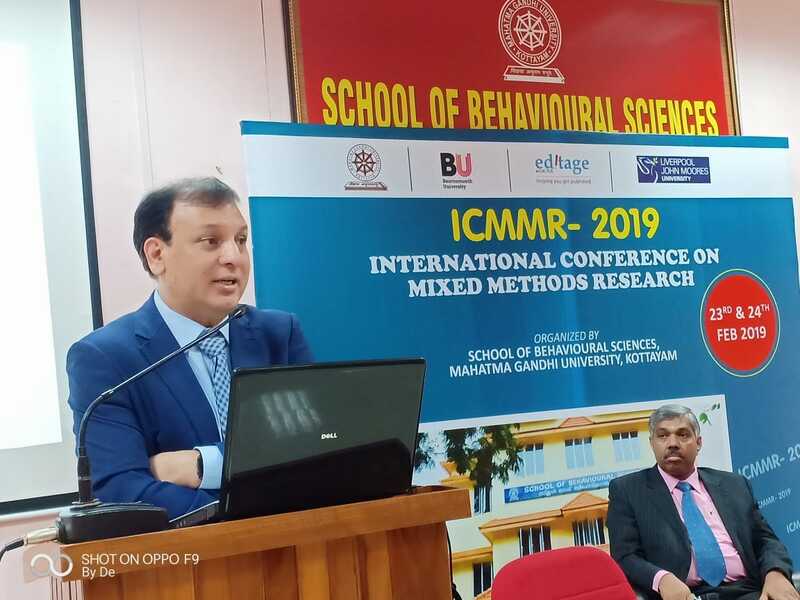 BU contributes to International Conference in India. 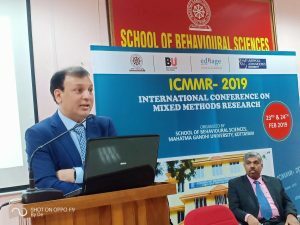 This past weekend saw BU Visiting Professor Padam Simkhada, who is a Professor of International Public Health in the Public Health Institute at Liverpool John Moores University (LJMU), delivering the keynote speech in an International Conference on Mixed-Methods Research (ICMMR 2019). His presentation at the conference, held at the Mahatma Gandhi University in Kerala (India), was held on Saturday. 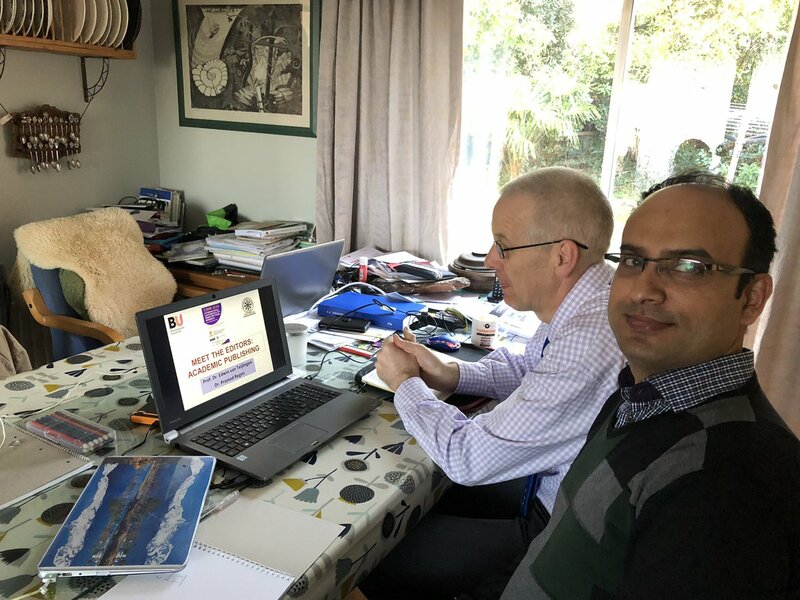 The next day (Sunday 24th February) the two Bournemouth University academics Dr. Pramod Regmi and Prof. Edwin van Teijlingen and facilitated a session on academic publishing under the heading “Meet the editors” via Skype. Over 200 delegates from 10 countries, mainly from India and other South Asian countries participated in the conference. BU focuses its global collaborations on three geographical areas, one of these is the Indian sub-continent. 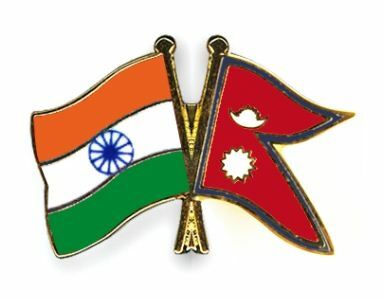 Connect India is BU’s strategic Hub of Practice for the Indian sub-continent, bringing together a community of researchers, educators, practitioners and students to collaborate with colleagues in India and Nepal. 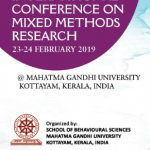 Dr. Pramod Regmi and Prof. Edwin van Teijlingen (both in the Faculty of Health & Social Sciences) have been invited to join the scientific committee of the International Conference on Mixed Methods Research [ICMMR-2019]. 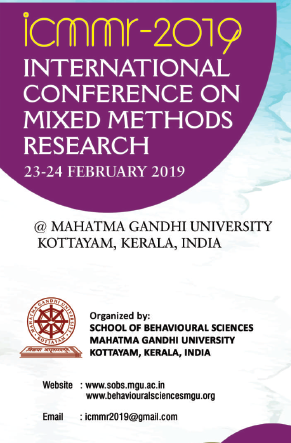 This year’s ICMMR conference will be held in the School of Behavioural Sciences at the Mahatma Gandhi University in Kottayam (India) on February 22-24, 2019. The two BU academics will run an online panel discussion session on academic publishing under the heading “Meet the editors.” The advantage of such online session is that BU academic don’t have to travel to India saving time and money as well as the environment. 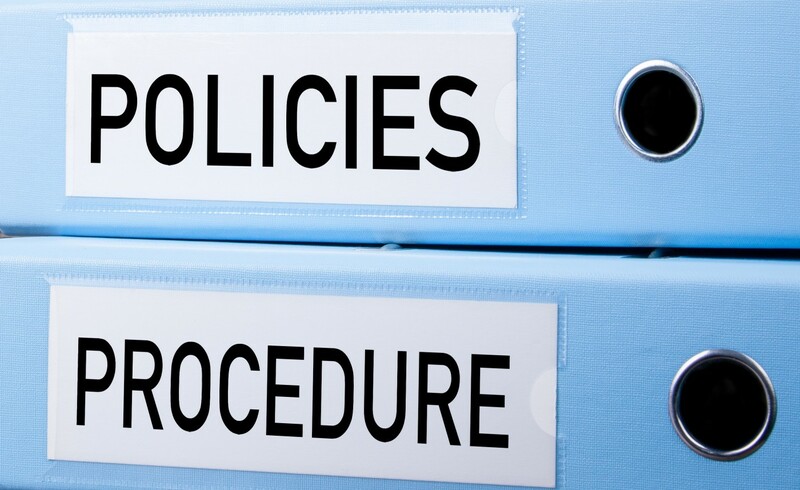 This has benefits for their own work-live balance as well as their carbon footprint. 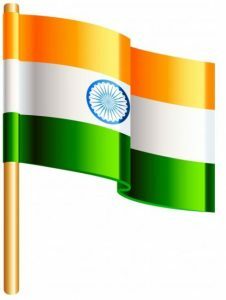 BU focuses its global collaborations on three geographical areas, one of these is the Indian sub-continent. 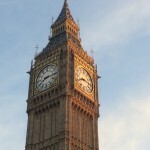 Connect India is BU’s strategic Hub of Practice for the Indian sub-continent, bringing together a community of researchers, educators, practitioners and students at Bournemouth University to collaborate with colleagues in India and Nepal. Last Saturday Festival of Learning highlighted BU’s research in the fields of health and migration in South Asia. 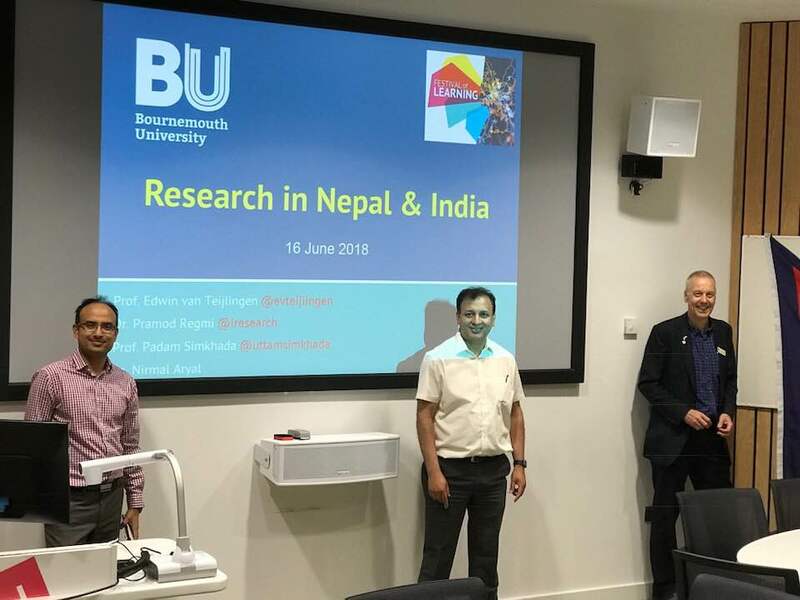 BU Visiting Professor Padam Simkhada from Liverpool John Moores University (LJMU) presented selected studies with Dr. Pramod Regmi and Prof. Edwin van Teijlingen in the Create lecture theatre. Their work covers some of the recent research conducted in Nepal by staff from the Faculty of Health & Social Sciences. They highlighted two very interesting, but different, projects in particular. 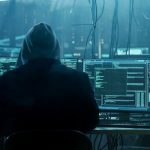 The first one relates to Nepali migrant workers, since some 3.5 million Nepalese (14% of total population) are working abroad; primarily in Malaysia, the Middle East and India. 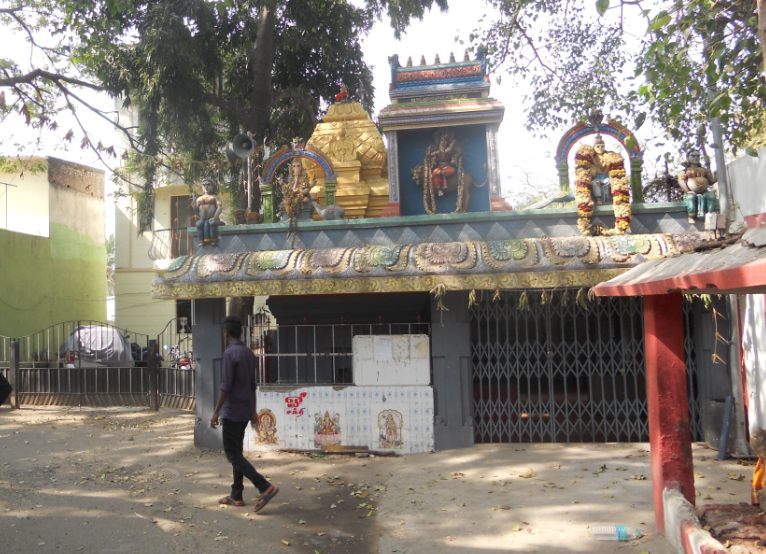 One recent project is focusing on Nepali migrant workers in India. Working abroad is considered a livelihood strategy for many poor people and most Nepalese migrants are involved in semi/unskilled labour, mainly on building sites, in factories, and in domestic work. 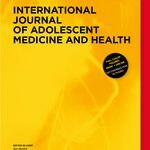 The second project focuses on the health and social issue of transgender and the use of hormones. To date there is little literature on hormone use experiences in transgender populations in Nepal, focusing on a study of male-to-female transgender (MTF) populations and the experiences of people using hormone therapy (oral or injection or other replacement therapies). 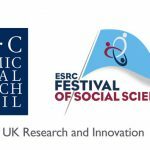 Festival of Learning event 2018 with an international flavour: exploring recent research projects undertaken in Nepal by staff from the Faculty of Health and Social Sciences. 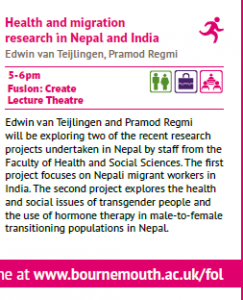 The event focuses on Nepali migrant workers in India, women and migration and explores the health and social issues of transgender and the use of hormone therapy in male-to-female transitioning populations in Nepal. Free tickets can be found here! 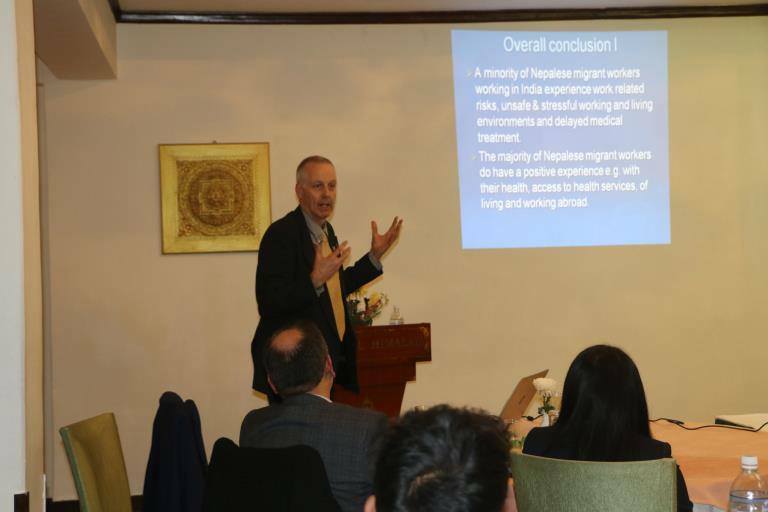 Yesterday (Monday 26th February) we disseminated the preliminary findings of our study on ‘Health vulnerabilities of cross border migrants from Nepal.’ The study was funded by IOM (International Organisation for Migration) in Kathmandu. 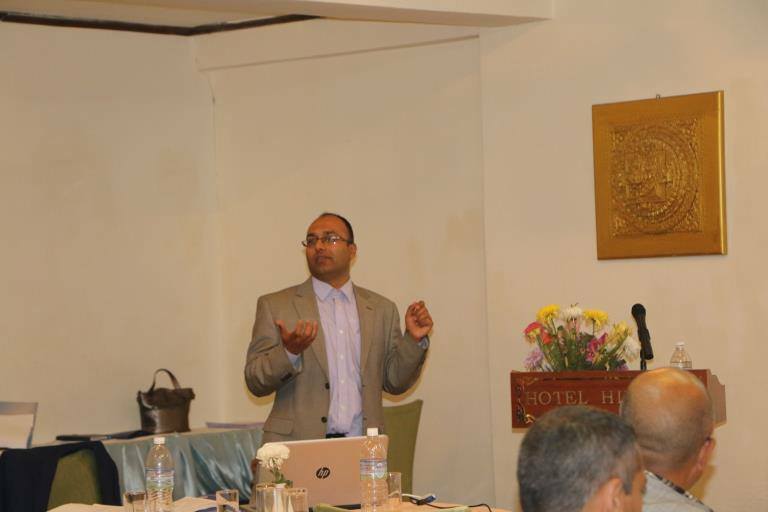 The main findings were outlined one of the researchers from Green Tara Nepal. 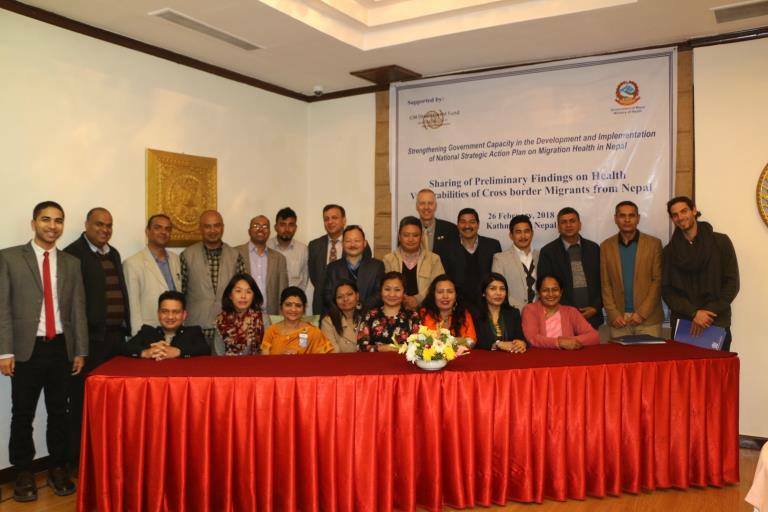 The study was conducted in Nepal by Nepali researchers Drs. 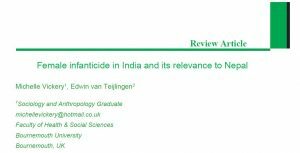 Pratik Adhikary, Nirmal Aryal and Raja Ram Dhungana, with methodological support from Prof. Padam Simkhada (Liverpool John Moores University) and BU’s Prof. Edwin van Teijlingen. 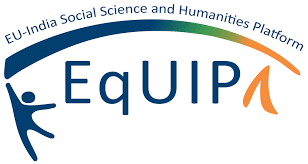 The mixed-methods study included a cross-sectional study of 752 Nepali migrant workers who had returned from working in India as well as focus groups and interviews with a sub-sample of returnees and interviews with two key informants. 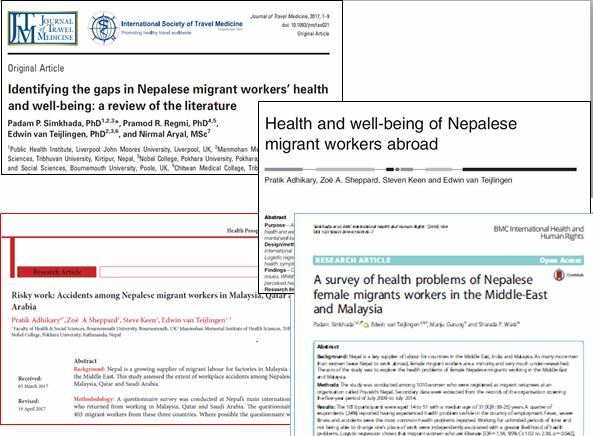 The research team also highlighted some key issues raised in two recent migration and health papers co-authored by some of the contributors to the dissemination event [1-2]. 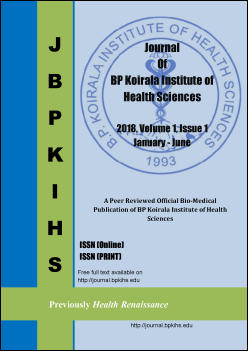 The project has strong link with Bournemouth University, Prof. Simkhada is Visiting Professor in BU’s Faculty of Health & Social Sciences (FHSS), Dr. Pratik Adhikary is a BU Ph.D. graduate and Dr. Nirmal Aryal has just been appointed in FHSS as a Post-Doctoral Researcher in preparation for REF 2021. 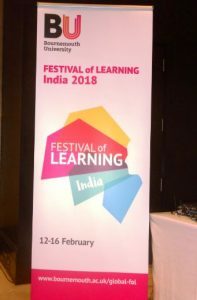 Today is the third day of BU’s Global Festival of Learning, after a successful visit to Chennai the team arrived last night in Pune. 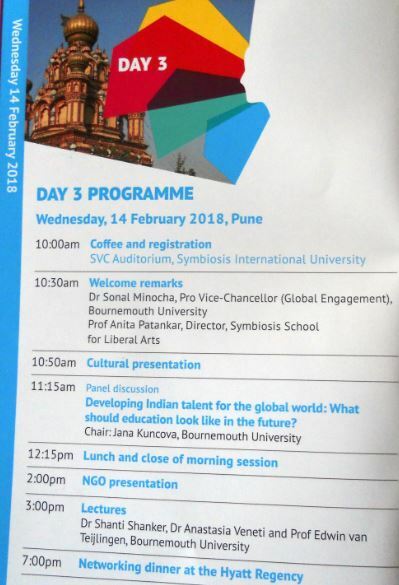 Today part of the academic programme includes lectures at Symbiosis School of Liberal Arts. The lectures will be given by Dr. Shanti Shanker, Lecturer in Psychology, who is associated with BU’s Ageing & Dementia Research Centre, Dr. Anastasia Veneti, Senior Lecturer in Marketing Communications, and Prof. Edwin van Teijlingen, who is based in the Centre for Midwifery, Maternal & Perinatal Health in the Faculty of Health & Social Sciences. 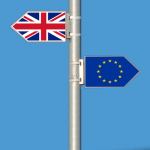 We have received an update from the European Research Council, which highlights…. 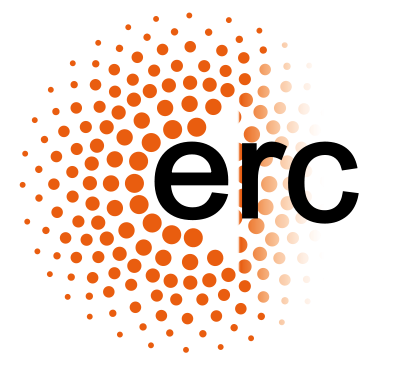 The current ERC Starting Grants call has now closed with results due in the summer of 2018. 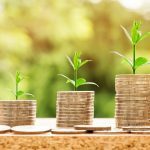 The ERC Work Programme has earmarked €581 million for an estimated 391 Starting Grants in 2018. 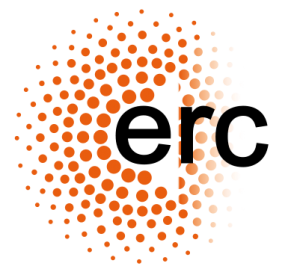 Ideas, the ERC newsletter, autumn issue is now available, with a focus on serendipity in research. An agreement has been concluded between the EU and India to encourage research visits of Indian top researchers in teams funded by the European Research Council (ERC) in Europe. In line with the ERC global approach, this is the tenth international initiative of this kind, which comes at a time when the ERC also marks its tenth anniversary. 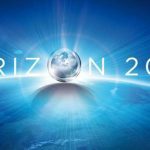 The first initiative of this kind was signed in 2012 with the USA (National Science Foundation, NSF) and agreements then followed with prestigious funding bodies in South Korea, Argentina, Japan, China, South Africa, Mexico, Brazil and Canada.